Somebody turned on the stove. 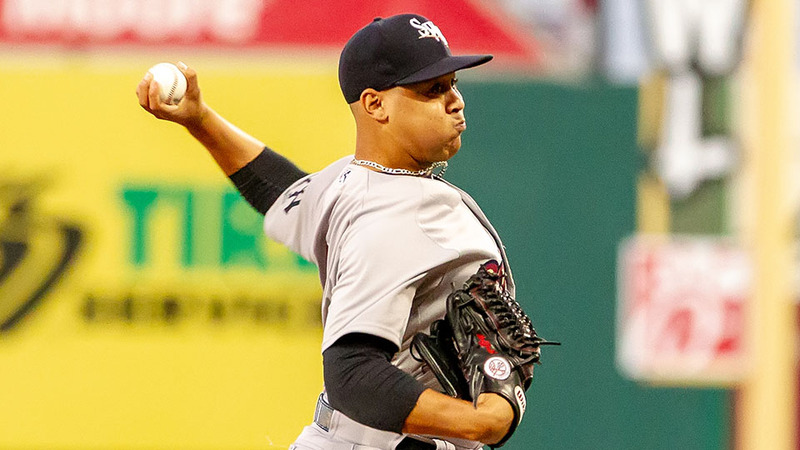 The first major trade of the offseason came Monday when the Yankees parted with top-ranked prospect Justus Sheffield along with right-handed pitching prospect Erik Swanson and Minor League outfielder Dom Thompson-Williams to land Mariners left-hander James Paxton. "To add three dynamic athletes who are entering the prime of their respective careers, while also maintaining six seasons of club control for each, is very exciting," Mariners general manager Jerry Dipoto said in a released statement. "Justus Sheffield has an unquestionable prospect pedigree. With a combination of high-end velocity to go along with an advanced slider and a developing changeup, we think Justus has a chance to pitch at the upper portion of our rotation soon. Sheffield emerged as MLB.com's No. 31 overall prospect after a strong 2018 season that started with Double-A Trenton. The left-hander made five starts there before being promoted to Triple-A Scranton/Wilkes-Barre. With the RailRiders, Sheffield went 6-4 with a 2.56 ERA over 20 games (15 starts) in the Mniors. Toward the end of the season, New York's front office made the edict to convert him to a reliever with the hope the 22-year-old could positively impact the big league club out of the bullpen down the stretch. Sheffield made three appearances with the Yankees, surrendering three earned runs over 2 2/3 innings. The fourth-ranked left-handed pitching prospect in baseball did not make the team's postseason roster. This is the second time in Sheffield's career he has been part of a deal for a lauded lefty. The Indians, who took him in the first round of the 2014 Draft, shipped him to the Yankees, along with Clint Frazier and two other players, for reliever Andrew Miller at the non-waiver Trade Deadline in 2016. Sheffield will likely supplant Kyle Lewis as the top Mariners prospect. He'll also be the lone Seattle prospect to ranked in the Top 100. As for the other two players headed to the Pacific Northwest, Swanson and Thompson-Williams were teammates at Iowa Western Community College in 2014, when the school won the 2014 Junior College World Series. Thompson-Williams, 23, spent the majority of last season with Class A Advanced Tampa. The University of South Carolina product produced a .299/.363/.546 slash line with 22 homers and 74 RBIs over 100 overall games in the Minors. "Dom Thompson-Williams is an electric athlete, who we think will move quickly through our minor league system," Dipoto said. "He brings a powerful left-handed bat, speed on the bases and athleticism in the outfield." Swanson was dominant in eight appearances (seven starts) with Trenton, posting a 5-0 record and a 0.42 ERA. He fanned 55 batters in 42 2/3 innings with the Thunder before going 3-2 with a 3.86 ERA over 13 starts with Scranton/Wilkes-Barre. He walked only 29 batters in 121 2/3 innings across all levels this past season. "Erik Swanson has performed at every level, combining a mid-90s fastball as well as two effective secondary pitches," Dipoto said. "At 25 years old, he is just entering the prime years of his career, and we think he will impact our Major League club in the near future." With the Yankees looking to bolster their rotation heading into 2019, general manager Brian Cashman dealt for one of the American League's more consistent starters over the last two seasons, when healthy. Since 2017, Paxton, 30, is 23-11 with a 3.40 ERA, 2.95 FIP and 1.10 WHIP.